If you're searching for a versatile Adirondack chair that is both weather-resistant and attractive, our top pick is L.L. Bean's All-Weather Adirondack Chair. While it's not made of wood, the eco-friendly polyethylene construction is more durable and will require less maintenance. You'll never have to worry about cracking, splintering, rotting, or re-painting, which means you can spend more time outside doing what you love. The stainless steel hardware also adds to their durability. If this chair does happen to get dirty, use a little soap and water to clean off any spots, or simply hose it down. Most users report that these chairs are much more durable than the wood ones they've previously purchased, and the comfort level is about the same. While they do require a little bit of assembly (they arrive in folded boxes), it's easy enough to take care of by yourself. Once they're built they can be folded down for easy storage in a garage or outdoor shed. Choose from seven different colors that are fade-resistant. Take a peek at some of the other best patio furniture you can buy. While an Adirondack chair is a quintessential summer symbol, they sometimes come with a hefty price tag. For a more budget-friendly option that still looks beautiful, we love the Leigh Country Classic Peach Painted Wood Adirondack Chair. For under $70, it’s worth scooping up right away. Despite the low price, you can still be confident this one is a quality piece. It has the same classic look as other, more expensive brands and it’s coated with weather-resistant paint. This coating serves two purposes: it helps extend the usable lifetime of the chair and gives the piece a charming look. For a more classic look, select white, hunter green, or red. If you're looking for something more vibrant, turquoise, seafoam, or pink should do the trick. Courtesy of Bed Bath & Beyond. Made from dense and durable eucalyptus hardwood, this Adirondack chair is both long-lasting and easy to maintain. The material performs like the much more expensive teak; it's sturdy and holds up well even under adverse weather conditions, including excessive rain and bright sunshine. Even though this chair is constructed of hardwood it's extremely comfortable. It has a deep seat that’s set at just the right angle for you to settle in comfortably. Plus, wide arms provide ample space for lounging—or a great spot for your beverage of choice. For an additional element of comfort that many Adirondack chairs don’t provide, this one comes with a detachable ottoman. It’s the perfect addition for those who love to stretch out and put their feet on something, but it can easily be stored if you don’t have space for it. If you’re concerned about longevity, or you live in an area with harsh temperatures, a plastic chair may be a more suitable option for you. If this is the case, look for a plastic Adirondack chair that’s manufactured to resemble wood. While some plastic chairs look fake, the Lifetime Adirondack Chairs are less shiny and have some faux graining, so they look like the real deal. Lifetime Adirondack Chairs are constructed of weather-resistant simulated wood, which is more durable than the real thing, and the material is just as high-quality as it looks. It’s UV-protected, so it won’t crack, chip, or peel over time. It’s also stain-resistant and easier to clean than natural wood options, which is a must if you plan to entertain frequently. The chair comes in five neutral shades that mimic the stains most widely available on natural wood Adirondack chairs. Interested in reading more reviews? Take a look at our selection of the best patio umbrellas. 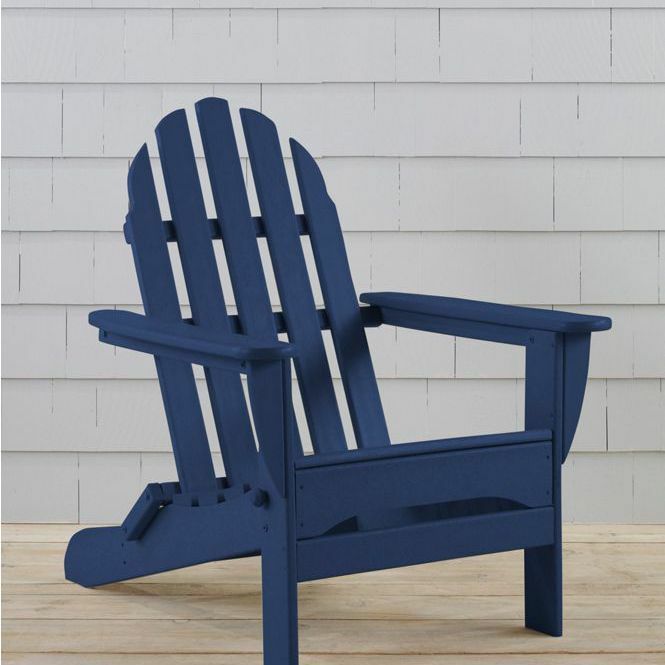 If the color selection is your top priority, look no further than the POLYWOOD Classic Folding Adirondack chair. It’s made of polywood lumber, a proprietary plastic containing recycled milk jugs and detergent bottles, so you will have to sacrifice having natural wood chairs. But it’s a small price to pay for their wide range of colors. This Adirondack chair comes in a full rainbow of shades, including bolder (and more tropical) shades like tangerine, lime, pacific blue, lemon, and sunset red. But, for those who prefer something more understated, it also comes in more neutral shades like black, green, sand, slate, teak, and white. The chair has other desirable features, too. It’s weatherproof, so it won’t splinter, crack, chip, peel, or rot when exposed to rain, sun, or even snow. Plus, it has a very comfortable seat depth and inclines. Another great feature? This Adirondack chair folds flat for easy storage when not in use. What’s better than one great Adirondack chair? A pair of great Adirondack chairs, of course. Though one chair is suitable for reading or lounging solo, having an extra chair is ideal for having friends and family over. This set is a great choice because it doesn’t compromise on quality or aesthetic. The chairs, which come in seven different colors, are constructed of shorea—a strong and durable material that resists precipitation and pests. With a wide, deep seat and a comfortable incline, these Adirondack chairs also make a great place to park yourself for an extended period of time. Like some of the other chairs on this list, they fold up for easy storage in your shed or garage during the off-season. When you’re purchasing a set of Adirondack chairs for the family backyard, don’t forget about the youngest members of your household. Full-size Adirondack chairs aren’t the most suitable choice for children, because they are hard for little ones to get in and out of. The deep seat and sharp incline overwhelm kids’ small frames. But that doesn’t mean your child has to miss out on all the fun—there are plenty of Adirondack chairs crafted especially for kids. This one looks just like yours, but it’s smaller and has a much shallower seat. Like full-size versions, this one has a weatherproof finish, so it will go the distance even in harsh climates. Parents will also love that this Adirondack chair is easy to assemble and uses paint that's safe for toddlers. It's available in four different colors so your child can choose their favorite one. You've finally found the perfect chair for your needs. It’s durable, attractive, and comfortable. Despite all of these great attributes, you might consider ordering a cushion for your chair. Even the most comfortable Adirondack chairs are quite firm, so if you intend to sit in the chair for long periods of time, you’ll be most comfortable when supported by a cushion. These cushions from Bossima have a moderate thickness to provide the support you need without overwhelming the structure of your chair. Plus, they’re made from a durable and water-resistant polyester fabric—perfect for outdoor use. If they do get dirty, these cushions are easy to clean. Simply untie the cushion from the chair (it attaches in four locations) and spot clean with mild soap and water. Choose from three smart color options: white with brown trim, red with white trim, or navy with white trim. For more outdoor design ideas, check out our list of the best patio furniture.